A medical specialist focuses on diagnosis and treatment of a particular organ or body system, a specific patient population, or a particular procedure. Medical care of humans is a complicated task due to the many different organ systems that comprise the human body. Each stage of life presents a variety of health issues that need to be addressed as well. Moreover, males and females also have very different medical needs through puberty and adulthood. This complexity of life necessitates a high degree of specialization in the physicians that care for people's medical needs. There are many types of medical specialties. All physicians, regardless of their ultimate specialization, must obtain a bachelor's degree from an undergraduate college and graduate from medical school (four years). During the last two years of medical school, students perform clinical rotations in which they are exposed to a wide variety of medical specialties. This provides broad training for all medical professionals, as well as gives the students an opportunity to choose a specialty. After medical school, all physicians are required to do a residency. The purpose of the residency is to provide specific, detailed training in the chosen specialty. The length of the residency is determined by the specialty. The tables on page 231 include the average residency length for each of the specialties listed. Oftentimes, physicians will have a particular expertise within their specialized area. For example, most surgeons are subspecialized in the organ system on which they operate (neurosurgeons, cardiac surgeons, and orthopedic surgeons are examples). These subspecialties are obtained during a fellowship period that lasts one to two years after the residency is completed. It is not uncommon for a highly specialized doctor (such as a pediatric neurosurgeon) to invest ten years or more in his or her medical education after graduating from college. Cardiologist. A cardiologist is a physician who cares for people with heart disease. Cardiologists treat conditions such as myocardial infarction (heart attack) and angina (chest pain). They use diagnostic tools such as an electrocardiogram (EKG) and ultrasound to visualize the electrical and structural functioning of the heart. Cardiologists are employed by hospitals but also work in private practice. Since cardiology is considered a subspecialty of internal medicine, cardiologists must first complete a residency in internal medicine that lasts about three years after medical school. Cardiologists then complete a subspecialty residency in cardiology (another three years). A surgeon reviewing CAT scans. disease, traumatic brain or spinal cord injury, epilepsy, or stroke. Diagnostic techniques used by neurologists to detect these disorders include (but are not limited to) sensory and motor skills assessments, memory tests, magnetic resonance imaging (MRI) scans, and positron emission tomography (PET). To treat these types of disorders, neurologists may prescribe medication, physical therapy, occupational therapy, or surgery. There are several new and very effective surgical treatments for diseases such as Parkinson's disease. Neurologists must complete at least four years of residency in an accredited neurology program before being eligible for certification by the American Board of Psychiatry and Neurology. Obstetrician/Gynecologist (OB/GYN). An OB/GYN specializes in the care of women from puberty through pregnancy and menopause. An obstetrician focuses on the care of pregnant women and the delivery of babies. Although some doctors choose to specialize in either obstetrics or gynecology, it is very common for a physician to specialize in both since the two fields are so closely linked. In addition to delivering babies, OB/GYNs perform diagnostic tests such as pelvic exams (to look for ovarian cysts and other abnormalities), pap smears (to screen for cervical cancer), and obstetrical ultrasound (to assess the development of a fetus). After medical school, OB/GYNs must complete a four-year residency. Many OB/GYNs practice their specialty in private practices that are closely affiliated with hospitals in which they deliver babies. However, most hospitals employ OB/GYNs directly as well. Oncologist. An oncologist cares for patients with cancer. Cancer is a very complex disease that demands very specialized attention and intensive treatment. It is common for an oncologist to specialize in a particular type of cancer, such as lung or colon cancer. Oncologists may work in private practices that are closely affiliated with a particular hospital or may be directly employed by a hospital. Like cardiology, oncology is considered a subspecialty of internal medicine. 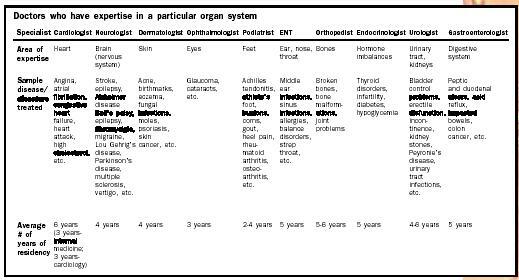 Oncologists must first complete a residency in internal medicine that lasts about three years after medical school. They then must complete a subspecialty residency in oncology (another three years). Sample disease/disorders treated AIDS-related lymphoma, leukemia, Hodgkin's disease, lung cancer, breast cancer, skin cancer, colon cancer, etc. Traumatic brain injury, emergency births, cardiac arrest, gunshot wounds, poisoning, etc. Asthma, hay fever, contact eczema, etc. Pediatrician. Infants and children have very specialized medical needs due to their rapidly changing and maturing bodies. Pediatricians are experts in the developmental stages of children and medical treatments of childhood diseases. In addition to treating childhood illnesses such as ear infections, jaundice, and respiratory infections, pediatricians also perform periodic exams of healthy children to ensure their proper development, administer immunizations to prevent disease, and advise parents on the proper care for each developmental stage. Pediatricians commonly work in private practice, but many are employed by children's hospitals as well. They are required to complete three years of residency before they are eligible for certification by the American Board of Pediatrics. Sample disease/disorders treated Angina, atrial fibrillation, congestive heart failure, heart attack, high cholesterol, etc. Stroke, epilepsy, Alzheimer disease Bell's palsy, epilepsy, fibromyalgia, migraine, Lou Gehrig's disease, Parkinson's disease, multiple sclerosis, vertigo, etc. Acne, birthmarks, eczema, fungal infections, moles, psoriasis, skin cancer, etc. Glaucoma, cataracts, etc. Achilles tendonitis, athlete's foot, bunions, corns, gout, heel pain, rheumatoid arthritis, osteoarthritis, etc. Middle ear infections, sinus infections, allergies, balance disorders, strep throat, etc. Broken bones, bone malformations, joint problems Thyroid disorders, infertility, diabetes, hypoglycemia Bladder control problems, erectile disfunction, incontinence, kidney stones, Peyronie's disease, urinary tract infections, etc. Peptic and duodenal ulcers, acid reflux, impacted bowels, colon cancer, etc. x ray, ultrasound, and MRI. All of these procedures produce a picture of the internal organs. Radiologists often serve as consultants to other specialists who need to visualize a specific organ in a patient that they are treating. However, radiologists do participate in treatments such as unblocking arteries in the legs and trunk that eliminate the need for more invasive procedures like surgery. 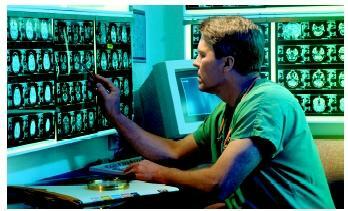 Although most radiologists work within hospitals, they are rarely employed by the hospital itself. Instead, they are employed by private practices and contract with the hospital to provide services. Radiologists must complete a residency of at least four years, and oftentimes they complete additional years of a fellowship to become an expert in a particular type of imaging technique. American Board of Medical Specialties. <http://www.healthcommunities.com/> . i want to have another child will i b able to without any tubes. i hav every thing esle.